J1749 is the first accreting millisecond pulsar to undergo eclipses. The pulsar and its companion star are separated by 1.22 million miles, or about five times the distance between Earth and the moon. In a strangecosmic first, astronomers have discovered a pulsing X-ray neutron star? the ultra-denseleftovers from a supernova explosion ? being eclipsed by anothercompanion starin deep space. The uniquestar pair sits 22,000 light-years from Earth and was discovered usingNASA'sRossi X-ray Timing Explorer satellite. It offers astronomers a rarechance tostudy the inner workings of neutron star systems. In thisbinary star system, known as Swift J1749, a normal star is eclipsing a pulsar? a fast-spinning neutron star that emits rotating beams of light likealighthouse. Scientists can only see this light when the beams arepointingtoward Earth, so its light appearsto pulse ? hence the name. 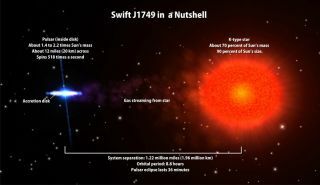 Swift J1749'spulsar is only 12 miles (20 km) across, but 60,000 times denser thanour sun. Itspins 518 times per second ? as fast as the blades of a kitchenblender. Thebeams the pulsar emits are in the X-ray range of theelectromagnetic-radiationspectrum. The eclipsesmark the first time a fast X-ray pulsar has been observed beingeclipsed by itscompanion star. But theeclipses had more than mere gee-whiz appeal for astronomers. Trackingthepulsar's motion revealed a great deal about Swift J1749 ? and couldshed lighton other neutron-star systems like it. "Usingthis information, we now know the size and mass of the companion starwithunprecedented accuracy," said researcher Craig Markwardt of NASA'sGoddardSpace Flight Center in a statement. The normalstar is about 70 percent as massive as the sun, but it's about 20percentlarger than its mass and apparent age suggest it should be. Markwardtthinks heknows why. "Webelieve that the star's surface is 'puffed up' by radiation from thepulsar,which is only about a million miles away from it," Markwardt said. "This additional heating probably also makes the star's surfaceespeciallydisturbed and stormy." The nextstep for astronomers may be to keep their eyes on Swift J1749, but tofocus on the normal star this time. "Weneed to detect the normal star with optical or infrared telescopes,"saidTod Strohmayer, Rossi satellite project scientist at Goddard. "Then wecanmeasure its motion and extract the same information about the pulsarthat thepulsar's motion told us about the star." Doing thiswould help nail down the mass of the pulsar, which is estimated to bebetween1.4 and 2.2 times that of the sun. Markwardtand Strohmayer describe their results in the July 10 issue of TheAstrophysicalJournal Letters.